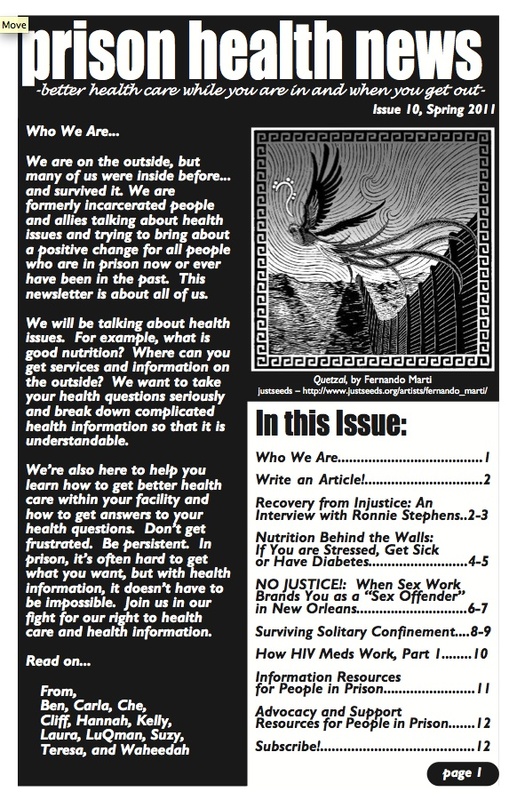 Prison Health News: Spring 2011 Issue Available for Download! The spring issue of Prison Health News has been out for a few months — but it is such a good one, I hate to see it go! plus, addresses for Advocacy and Support Resources and Informational Resources! What I’ve learned from the AIDS movement about the importance of confronting stigma is amazing. Cathy Cohen argues in The Boundaries of Blackness: AIDS and the Breakdown of Black Politics http://www.amazon.com/Boundaries-Blackness-Breakdown-Black-Politics/dp/0226112896 that the failure to fight the stigmatization of Black queers, homeless people, drug users, prisoners — everyone most at risk for HIV — has hurt the whole Black community by allowing the proliferation of prisons, the War on Drugs, gentrification, etc. What I see in movements that take on stigma and celebrate our vulnerable, creative, marginal humanity is this incredible, energetic defiance that really moves people to participate and become leaders. “…the vitality of any movements come from bringing the the margin to the center, not the other way around…. There is an overwhelming logic that the only way for activist movements to be effect is to bring the center to the margin: tone down the rhetoric, clean up your act and then people will listen.And maybe they will. But whats the point of speaking if you have forgotten what to say? That is understandable because the center has gravity: money, connections, power, and popularity. But movements don’t grow from the center. They grow from the margins and take over the center. Think about it; every musical movement in this country has come from the oppressed experiences of Black and Brown people. Blues, jazz, salsa, hip hop are common currency and they all occurred at the bottom.